Now there is a father of the bride t-shirt to tell the world that your little girl is getting married. 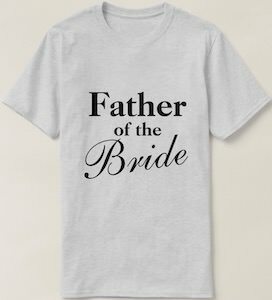 This t-shirt simply says “Father of the bride” and makes for a fun present for your dad so that he has something to wear for all the wedding preparations and maybe it can even be the surprise you want to give him after you get proposed. This father of the bride t-shirt is available in many styles, sizes, and colors so that it is the perfect shirt for your dad that fits in to your wedding decor. If you want the world to know how amazing your dad is then surprise him with this superdad t-shirt. You can get this t-shirt in many colors and sizes so that it is just perfect for your father and as it comes in many styles too you really get something amazing for your dad. 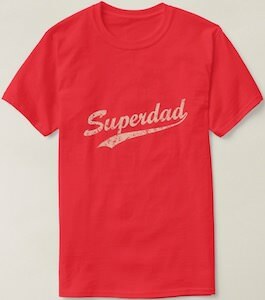 On the t-shirt is shows the text “Superdad” in a worn looking logo style and that makes this a fun shirt that your dad can wear any day of the year and especially on fathers day. This t-shirt makes for the perfect present for your dad on those special days like birthday, fathers day or any other day you want to surprise him. If your dad is okay then you should surprise him with this world’s okayest dad t-shirt. Now you have the perfect t-shirt to get your dad for his birthday, Christmas, and fathers day. 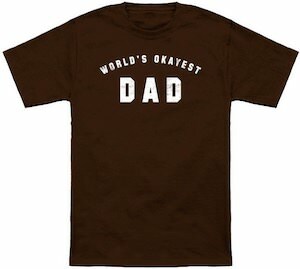 The t-shirt just says in big white letters “World’s Okayest Dad” on it and you can get this t-shirt in many dark colors to make it perfect for your dad. Your dad’s new t-shirt is made from 100% cotton and is available in sizes Small – 6XL so that you can get him a perfect fitting funny and cool t-shirt that he will love to wear all over town. This dad loading t-shirt is a great way to tell the world you will be a daddy soon. 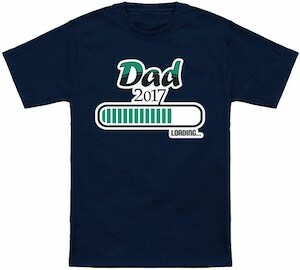 On the t-shirt, it shows a loading bar with the word “loading…” below it and above it the text “Dad 2017”. So when you wear this t-shirt everyone will understand that you will be a daddy soon. The t-shirt also makes for a great gift from a soon to be mom to the soon to be dad just to bring the news. You can get this dad loading t-shirt in many colors and it is available in sizes Small – 6XL and all are made from 100% cotton. This white men’s t-shirt is all about becoming a Dad for the first time. 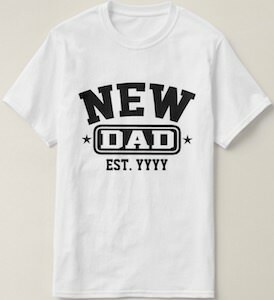 On the t-shirt is says in big letters “NEW DAD” and below that it says “EST.” and next to it the year of your choosing so that it is all current for you. This t-shirt also makes for a great gift from the new mommy as a way of telling the daddy that you are pregnant. You can get this New Dad t-shirt in men’s sizes Small – 4XL and all are made from 100% cotton. Show the world who is the New Dad by wearing this t-shirt and be proud of it. This t-shirt if for the men out there that have a dog that they love as much a child. 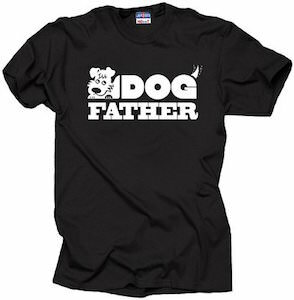 On this black t-shirt it says “Dog Father” and the word dog also looks like a dog with the nice head and tail sticking out of the word. Just wear this t-shirt and show the world how important you dog is. And it also makes for the perfect present for a dog father for those special days like fathers day or a holiday. This t-shirt is made from 100% cotton and is available in sizes Small – 3XL. Your dad is like a superhero of course and you should reward him for that. This t-shirt could be the perfect present for fathers day, his birthday or any other day you want daddy to feel special. 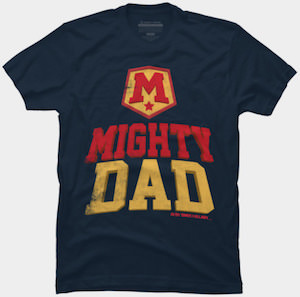 On this t-shirt you can see a big M logo and below it the text “Mighty Dad” and all that has a worn look so that it looks like it has been know to the world for a long time that your father is a superhero. You can get this Mighty Dad t-shirt in many cool colors and in men’s sizes Small – 3XL and they are all made from 100% cotton so that it feels really comfortable to wear. This t-shirt is great for dad or for women and kids to wear to show that they know what daddy likes. On the t-shirt you can find the text “Daddy’s Toys” and around that text you can find many fishing lures in many shapes and colors and by wearing the t-shirt you will make it clear that dad likes to go fishing. It’s just a great shirt that you can give your dad for father’s day or any other occasion or buy one for yourself to show you dad that you know what he likes. You can get this t-shirt in many different colors and sizes. If you want a fun present for your dad then this t-shirt could be the perfect shirt to get him. On the t-shirt it says “Have No Fear Papa Is Here” and that of course is true for your father. A t-shirt like this is great to give your dad at any day or a special occasion like his birthday or maybe even fathers day. You can get this t-shirt in many fun colors and in sizes Small – 3XL and they are all made from 100% cotton so that he can be really comfortable in it. Grandpa, get ready for the best t-shirt ever. He is going to love this t-shirt and wear it any where and everywhere. There are only words for the graphic on this t-shirt. “Great Dads Get Promoted to Grandpas”. It will make a great gift for any Dad you know that may have a little Grandchild on the way or any one that is already a Grandfather. Either way, it is going to get a smile. This t-shirt comes in many colors, even camouflage, it will make any Grandpa happy. It comes in sizes ranging from a Small all the way to the 6XL size. 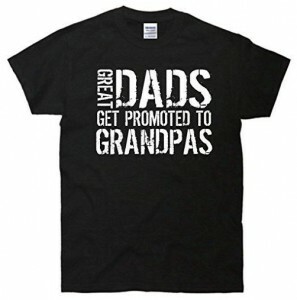 Grandpa, put on your Dads Get Promoted T-Shirt.